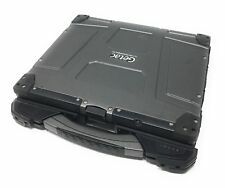 This is a used Getac B300-X rugged laptop. Getac B300-X. TYPE Notebook. AC Adapter: Yes (compatible). Hard Drive RELEASE YEAR 2011. PROCESSOR SPEED 2.00GHz. Optical (DVD-Rom). We would be happy to assist further as needed. Tested for full functionality. R2/Ready for Reuse. Boots to BIOS. Processor: Intel Core i7 1st Gen. Storage: 256GB SSD. Common blemishes include scuffs, minor to moderate scratches, small dents, chipped paint, or bright spots on the screen, and/or missing or degraded rubber feet. Display: 13.3" HD. Storage 128 GB SSD. RAM 4GB DDR3 RAM. Optical NONE. Display 13" LCD. No other accessories included. As such,included batteries are sold as is. If we are unable to verify your order, it may be cancelled. Dell XPS L322X i5-3317U 1.70GHz 4GB RAM 128GB mSATA No Batt. Storage: 128GB mSata. Battery: None. (d) 13" 1920x1080 FHD. No battery. Minor scratches on top of case, minor scuffs on bottom. All refurbished products marketed by Transpere have been fully tested by our trained technicians. This laptop has scuffs/scratches from use but overall is in good shape. This has been tested and it is in good working order. Unless otherwise stated, this has been tested for key functionality. DELL E6320. 4GB PC3 1333MHZ. Tech support and software support are not implied or provided. NO ADAPTER. INCLUDED NO WARRANTY. When your product is no longer useful or has reached its end of life, we ask that you recycle it through 3R Technology Solutions, Inc.
Model: 3330. Electronics Cafe specializes in used electronics. This laptop is used and is in good working order. There is a crack near the battery(See Photos). The screen may have minor scratches, burns, blurriness, lines or shadows. RAM 4GB DDR3 RAM. Battery Not Included . Storage NO HARD DRIVE. Optical NONE. No other accessories included. As such,included batteries are sold as is. If we are unable to verify your order; your order may be cancelled. 128GB mSATA. It has been tested working and functions as designed. See pictures for details. Battery has been removed due to low capacity. Blancco was used to test the battery levels. 13" 1366x768 HD LED LCD, No Battery, No OS installed. (2x2GB) 256GB mSATA No OS installed. Minor scuffs on top and bottom of case. @ 2.30 GHz 4GB DDR3. @ 1.60GHz 4GB DDR3. (c) All key functions of this system have been tested and are functioning as intended. Model: E4310. This laptop is used and is in good working order. There is small piece of plastic from the top cover(see pics). The screen may have minor scratches, burns, blurriness, lines or shadows. Model: A1465 5,1. Electronics Cafe specializes in used electronics. This laptop is used and is in good working order. The screen does not have scratches, burns, blurriness, lines or shadows. The battery cycle count is 142. Model: A1369. Electronics Cafe specializes in used electronics. max-width: auto; }. This laptop is used and is in good working order. There is a dent on the front right corner. The screen may have minor scratches, burns, blurriness, lines or shadows. Tested and Working. missing hdd, hdd caddy and ac adapter. 256GB solid state drive. Stylus not included. Missing one port cover. Screen is in excellent condition, with no noticeable scratches. AT: FLX012319-1008. Loc: J3 LID: MH. As such, included batteries are sold as is. Model: E6330. Electronics Cafe specializes in used electronics. This laptop is used and is in good working order. The screen does not have scratches, burns, blurriness, lines or shadows. This laptop does have a valid Windows COA. Samsung Notebook5 NT500R3W-KD2S 13.3" FHD 4415U 2.3GHz 128G 4Gb DOS 1.45Kg White. Samsung Notebook5 NT500R3W-KD1S 13.3" FHD 3865U 1.8GHz 128G 4Gb DOS 1.45Kg White. Model: 3330. This laptop is used and is in good working order. The screen does not have scratches, burns, blurriness, lines or shadows. This laptop does have a valid Windows COA. This system does NOT include AC power adapter, caddy, hard drive, or any other accessories. ITEM INCLUDES STYLUS PEN. NO AC ADAPTER INCLUDED! NO CADDY! No Other Cables or Components Included. We are a team of experts who are flexible, attentive, and responsive. NurTech Technology, LLC, was established in 2006. This laptop is used and is in good working order. The screen may have minor scratches, burns, blurriness, lines or shadows. This laptop may not have a valid Windows COA. This system does NOT include AC power adapter, hard drive, caddy, or any other accessories. May or may not be BIOS LOCKED. Model: Gd8000. Make: General dynamics. Speed: 1.86 ghz. wifi included. SUM Computers Inc. Dvd rom / cover broken. Coa sticker: None. Hard drive and hard drive caddy are not included. Panasonic Toughbook CF-74 Rugged Laptop. Incomplete Rugged Laptop. Unit is BIOS locked and missing HD Caddy, RAM cover; no OD dummy. This is anincomplete laptop, its hard drive has been removed for security reasons. Ac adapter is not included. Fujitsu T900 Notebook/Tablet. Stylus Included. No A/C adapter included. 13.3" Flip Screen. Tested For Key Functions R2/Ready for Resale. All ports have been tested to pass key functions. 160 GB Hard Drive. Model: 3340. This laptop is used and is in good working order. The screen may have minor scratches, burns, blurriness, lines or shadows. This laptop may not have a valid Windows COA. This system does NOT include AC power adapter, hard drive, caddy, or any other accessories. Brand: DellProcessor: Intel Core i3 4th Gen.
Model: E6330. Electronics Cafe specializes in used electronics. This laptop is used and is in good working order. The screen may have minor scratches, burns, blurriness, lines or shadows. This laptop may not have a valid Windows COA. It powers on and booting to BIOS normally. No HDD caddy. Model: E6320. This laptop is used and is in good working order. The screen may have minor scratches, burns, blurriness, lines or shadows. This laptop may not have a valid Windows COA. This system does NOT include AC power adapter, hard drive, hard drive caddy, or any other accessories. Brand: DellProcessor: Intel Core i5 2nd Gen.
Model: E6330. This laptop is used and is in good working order. The screen may have minor scratches, burns, blurriness, lines or shadows. This laptop may not have a valid Windows COA. This system does NOT include AC power adapter, hard drive, caddy, or any other accessories. Model: E6320. This laptop is used and is in good working order. The screen does not have scratches, burns, blurriness, lines or shadows. This laptop does have a valid Windows COA. This system does NOT include AC power adapter, battery, caddy, hard drive, or any other accessories. Model: E6320. This laptop is used and is in good working order. One of the docking ports has a crack(See Photos). The screen may have minor scratches, burns, blurriness, lines or shadows. This laptop may not have a valid Windows COA. Model: 3330. This laptop is used and is in good working order. The screen may have minor scratches, burns, blurriness, lines or shadows. This laptop may not have a valid Windows COA. This system does NOT include AC power adapter, hard drive, hard drive caddy, or any other accessories. Model: 3330. Electronics Cafe specializes in used electronics. This laptop is used and is in good working order. The screen may have minor scratches, burns, blurriness, lines or shadows. This laptop may not have a valid Windows COA. Brand: DellProcessor: Intel Core i3 3rd Gen.
Model: 3340. Electronics Cafe specializes in used electronics. This laptop is used and is in good working order. The screen does not have scratches, burns, blurriness, lines or shadows. This laptop does have a valid Windows COA.